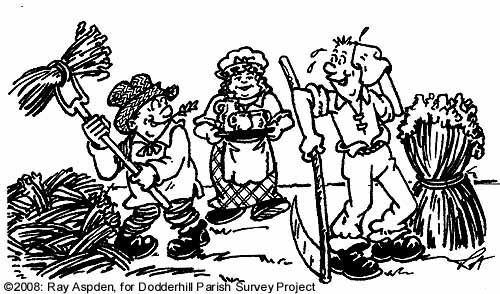 Dodderhill was an agricultural community, the parish being divided in the medieval period into districts or ‘yields’ known as Impney, Astwood and Wychbold (as recorded in the medieval manor court rolls for instance). Within these areas there were large common fields, each field divided into strips of about an acre; there were no hedges between the strips. Farmers had strips, called ridges, scattered throughout the fields, which was fair in the sense that each had both good and poor land. The strips of land could be farmed or let to tenant farmers. Traditionally the crops grown were farmed in rotation; rye was sown in winter, barley in spring followed by the land being rested as fallow. However, there was no evidence of this in the Dodderhill inventories but barley was grown predominantly in the spring at the time that wills and inventories first become a useful source of evidence. It would seem that Dodderhill had ample good pasture for the raising of cattle, presumably implying that the clayey soils were fertile and well-watered. Its close proximity to both Droitwich and Bromsgrove may have encouraged local farmers to concentrate on dairy rather than beef cattle, as dairy produce would have been relatively saleable at these regular nearby markets. Relatively small farms could produce quick and frequent returns from dairying, selling their produce in the towns. From the 17th century it is clear that the successful farmers increased their stockholding and specialised particularly in making cheese. Farmers were able to keep their land in good heart with the increased use of pulses and the gradual spread of clover, improving the soil so that wheat replaced rye. Large quantities of the grain would have been ground at the local Wychbold mills or transported to the town mill at Droitwich to make the main staple of the workers’ diet, bread.